HomeAgricultureEducationEnvironmentGadgetsGreen ProductsLifestyleTransportVehicleWelfare15-Year Old Antonin’s Bamboo Bicycle Project Aims to Help People and Environment! 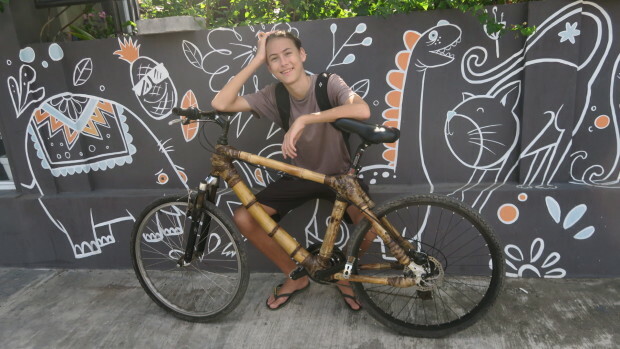 15-Year Old Antonin’s Bamboo Bicycle Project Aims to Help People and Environment! People prefer bicycle rides for their last commute journey which has economic, health and environmental merits. It is the second least polluting mode of transportation after walking since horse riding is not such a common mode anymore. And just like walking and horse riding, it allows you to feel in communion with the environment you are journeying amongst. The bicycle travel seems to be the most efficient means of transportation when it comes to cutting down on pollution and also improves the traffic situation in urban areas. Generally, the traditional bicycles made-up of steel or plastic blended frames has a negative impact on our eco-system due to its materials and manufacturing processes. But Antonin Van Der Gulik from Bali, a 15-year old boy taking eco-friendly travel to next level. His ‘Lelio Bicycles Project’ aims to promote ‘plant built’ bicycles from bamboo! This social initiative will not only lower the carbon footprint in the environment but will spread awareness among people to follow the clean technology for their daily lifestyle products. The frame of the bicycle, instead of metal, is made entirely out of 100% recyclable material - bamboo which is a grass that freely grows all over Asia and can easily be found in Bali where he lives. The main benefit of bamboo, it doesn’t corrode or rust and has strong mechanical properties. After its useful life, the bamboo waste can easily be integrated with the Mother Nature and other non-bamboo components of the bicycle can be transferred to another bike. Interestingly, Antonin made his first bamboo bike, taking the good parts of a bicycle frame that were rusted. He tuned and reworked these components to make a new bamboo bike frame! With the guidance of experts Klaus Volkmann and Mark Donovan from Ewabi, he built the Bamboo bike workshop. He plans to transform his existing space into a bamboo ‘plant based’ cycling machines. The part of the Lelio Bicycles project is also to create a collection of maps, to complement the bamboo bicycles, with insightful knowledge of the nature that inspired their creations. This non-profit project campaign is currently live at Indiegogo, to promote this bamboo bike concept. You can contribute to the project and make it a successful green product for our environment.